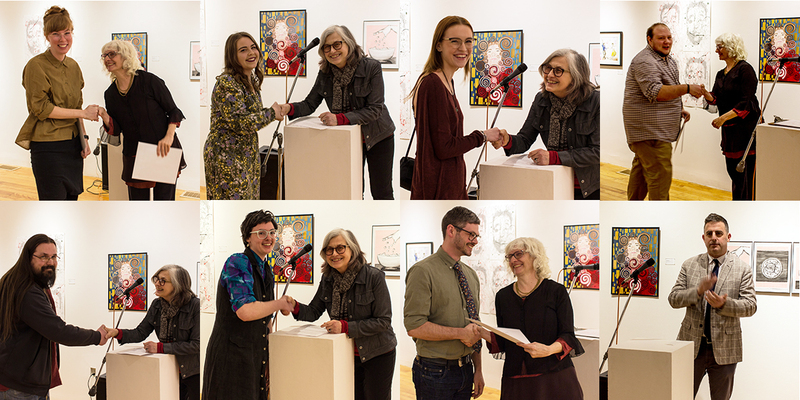 At this year's Student Juried Show Opening Reception on Thursday, March 14th, 28 Students were honored by having their work(s) selected by this year's Jurors to hang in the beautiful USM Gallery in Gorham. The three Jurors were Duncan Hewitt, sculptor and former USM professor, Adam Lampton, photographer and professor at Stonehill College, Easton,MA, and Catherine LaBarre, a teaching artist in Portland who works in painting and other mediums. Out of the 44 works in the Show the Jurors selected 5 works by 5 students to be singled out as particularly outstanding. Eight Art Department Discipline Awards were Also presented. The discipline awards acknowledge the accomplishments of art majors within the disciplines offered by the Art Department. These include art history, art education, book arts, ceramics, foundations, painting & drawing, photography and digital art & design, and sculpture. This public recognition honors the students and informs the audience of department programs. Recipients are nominated by faculty who teach within the disciplines. Each year we look forward to celebrating the work of outstanding students, including those who were selected for the Annual Student Juried Exhibition. On behalf of all Art Faculty the Art Department recognizes and congratulates these students for all their accomplishments! Exhibition dates are March 14-31, open Wed & Thurs noon-6 pm, Fri-Sun noon-4 pm. Open by appointment only during spring break March 18-22. USM Art Gallery, Gorham, Maine.